Following humble beginnings, Derric has emerged as one of the true heavyweights of the local and international art scenes. Having always felt a profound connection to the natural environment since early childhood, this versatile and prolific artist draws his inspiration from the abundant beauty found in the African landscape, as well as the rich variety of people, fauna and flora inhabiting it. To the delight of audiences at home and abroad, his broad brush strokes and sometimes abstract visual intensity, coupled with ingenious inpressionist flair, continues to capure the true aesthetic essence of this rugged continent. It all started at the age of ten when he completed his first pencil drawing, and his career later followed the commercial and manufacturing world of the creative arts. He progressed to teaching art before becoming a professional artist in 1986.He has contributed richly to the development of emerging artists in South Africa, not only through teaching art as a profession, but also through numerous workshops and private tutorials across the country. is rated as one of South Africa’s top artists. “I was born in 1952 in Cape Town, South Africa, but it was not the Mother City and its surrounding which impressed me. As a young boy I regularly visited my father’s family on the farm in De Vlugt, between Knysna and Uniondale. My school years were spent in Cape Town where I completed education at Art School in graphic art specifically. My career followed the commercial and manufacturing world of the creative arts, but something was missing. I felt the desire to be an artist but lacked the courage and conviction until in 1986 when my wife persuaded me it was not only possible but also necessary. “Enough was enough”. At first I taught, but longed for the day when a painting career alone would be sufficient to not only put bread, but also cheese, wine and fruit on the table. That wish happened, when in 1990 we decided to move to Greyton in the Overberg. This tranquil little town lies in the Riviersonderend Mountain valley. It is a sprawling patchwork of mainly wheat, oats and barley fields each season brining with it a variety of ochre’s, reds, oranges and greens punctuated by blocks of neon yellow canola fields. Weather conditions in the Overberg can be equally contrary. I am forever grateful for the six years spent in that area that might just as well be the South African version of the Provencal region of France, now doubtlessly famous after Peter Mayle’s book “A year in Provence”. Living in the Overberg has had a great impact on me and the incredible beauty of this area is, and always will be, evident in my work. 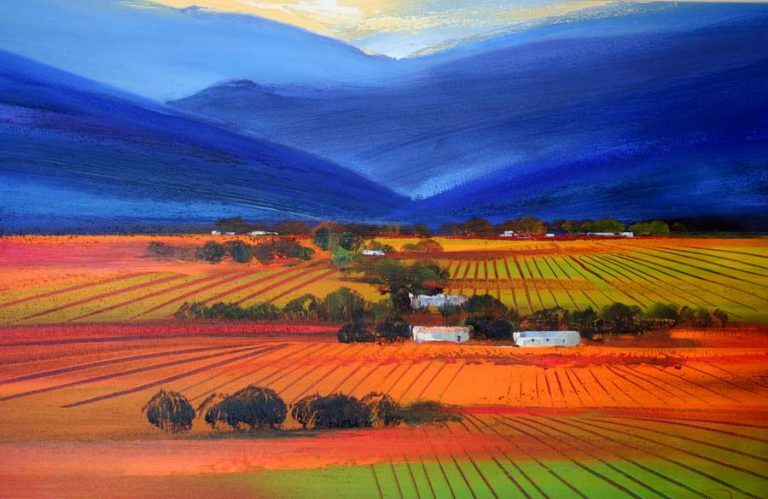 This perhaps explains why my Overberg paintings are referred to as my “trademark”! At the end of 1996 we returned to Cape Town. My eyes were opened to new vistas I has previously ignored. Colourful places like the Malay Quarter (Bo-Kaap) and the city-scapes have become part of my portfolio of subject matter. Back to the earlier days. I was once advises from the use of that modern “American” plastic product called acrylic in favour of the more socially acceptable medium of watercolour. Doing so I almost immediately sold my first painting – a watercolour! I was 18 years old and convinced this timely advice held a profitable key to my future. All seemed fine and well, until I returned from an exhibition in Portugal in 1988 with a new conviction to return to acrylic (being my original preferred medium). This had to be the way forward, but such was my frustration for the first year that I could hardly describe it as a “challenge”. To me it felt I had suffered some kind of quasi artistic nervous breakdown. At some point my parents returned a couple of very early acrylic paintings to me, which I had either not bothered to sell or give away and therein lay my answer to the proof I was looking for. Was it maybe amnesia I suffered? My conclusion was that I had been easily seduced away from something I originally understood, but paid no attention to the future seemed clearly acrylic! This new found freedom caused me some frustration for about a year when as if woken from a dream, I remembered two or three paintings I completed during my school years and passed onto my parents. Yes, they were acrylic! I still cannot understand how I was so easily seduced away fro a medium that suited me just fine. Black, indigo, reds, orange, green and ochre feature prominently in my work, reflecting my mood about this southern tip of Africa. Given that I made something of a living mainly as a wildlife watercolourist, the switch to acrylic hugely broadened my audience. But it took a very helpful critique by art historian Professor Dr Friedrich in Germany to put language and theory to my painted word “Van Rensburg” art is founded in the creativity of an environment conscious person, able to combine the virtues of the abstract non figurative art with a system of “Earthscape”. His work is an artwork, but his intention is to send a message anchored in this concept of “Earthscape”. Another magazine described me as follows, “An elusive enigma, Derric van Rensburg is nonetheless one of South Africa’s most popular landscape and wildlife artists. With his characteristic, spur-of-the moment style, he carves an impressive niche in the art market. His style is free, yet subtly contained, combining both abstract and realistic elements with the abstract being reflected by a wash effect”. When asked about staying inspired and motivated, I can only point to that well worn cliché about 10% inspiration and the rest is perspiration. I reference my own data from photos I take and manipulate to suit me. The studio is my engine room. Of the Old Masters it was Von Gogh and Rembrandt who inspired me most. Von Gogh because I enjoyed his life stories and the visual diary he left to the world, and Rembrandt because he was a craftsman and draughtsman of huge proportions. On the South African scene my favourite artists are Pieter Wenning and Hugo Naude, who have been a great inspiration to me. My first exhibition was in 1976 in Cape Town and was sold out within a few days. Since then I have exhibited many times in South Africa and also in Portugal, England, Italy and Australia. Most of my commissions are placed by multinational corporate clients including First National Bank, South African Airways, Transnet, Liberty Life, Price WaterhouseCooper, Reebok, Ernst and Young, Alexander Forbes BP and Mobil as well as a number of South Africa’s best known hotels. Many of my works also hang in homes throughout South Africa as well as major corporate companies in Australia, England, Switzerland, Portugal and Germany.